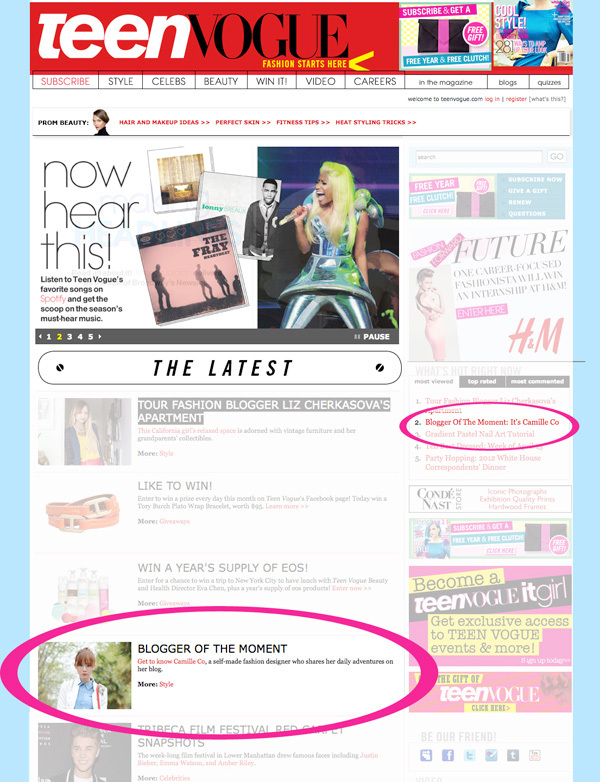 Guess who is TeenVogue.com’s blogger of the moment??? Woooooooooooooooot! I got so excited when I first got an email from TeenVogue.com requesting for an interview. I never thought I’d ever be on their website! Never in my wildest dreams! I mean the world wide web is such HUGE community! Who would’ve thought that someone from THE TeenVogue.com is watching? I’m still shaking my head in disbelief right now. Read my full interview here. Let’s go Pinoy! Wow! I’m so proud. <3 I've been your fan for 2 years already and I must say, You really deserve it Ate Camille! Hope you continue doing such a great job and keep on inspiring me! I really hope to see you one day! Congratulations! ! you deserve it ! ! the way you mixed up the colors! ! and also I really love the heels your wearing. Hi ate Camille! Wow, it’s amazing you got featured in Teen Vogue! Teen Vogue is my favorite magazine, and I can’t wait to see the article with you in it! Awww thanks JC! If ever I wasn’t able to reply to you before, baka hindi ko lang napansin, I’m so sorry! :) Keep blogging! I’m so proud of you Miss Camille! Thank you so much Joyce! I hope there’s a next one:) Fingers crossed! I saw this before I went to ‘Metrowear Rocks the Runway’ I wanted to congratulate you in person when I saw you in Shang but I was too shy to approach you cause so many people were surrounding you. Plus I’m only 14 and I was probably the youngest there, so I got really insecure when I saw you all sparkly and tall. Congrats on winning the most Stylish of the night btw. Haha. Thank you! Go go Pinoy! Thanks Alex! I wish I could but my closet is so ugly haha! Wow! :)) Congrats! you deserve it! :D Proud to be Pinay! Thanks Haley! Let’s go Pinoy! I hope so! :) Thanks Miles! Congrats Camille! 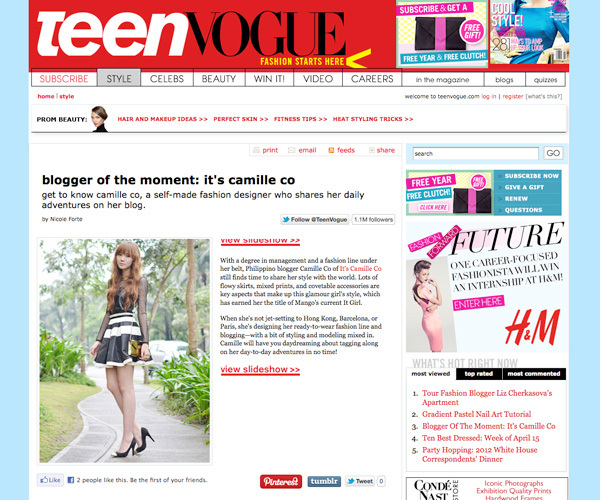 You have brought a lot of accomplishments for the Pinoy blogging scene already :) First Mango now Teen Vogue! Thanks Emily! :) I hope so! That’s amazing! Congratulations :D You truly deserve it.